Incline Village, Championship Course Hole 2: This short par five is a dogleg left around a large set of bunkers that are very difficult to fly from the tee. So, staying just right of them leaves a good shot at flying the lone bunker 30 yards short of the green to go for it in two. If not, three easy shots should do the trick as the only real danger is the OB left of the hole. Incline Village, Championship Course Hole 3: The longest par four on the front nine is a dogleg right with OB down the left side and deep bunkers right of the fairway. From the tee, the player can lay up into the low area of fairway short of the bunker or challenge the bunker for a short iron to the green, but the latter brings all the risks described above into play. the green has a large tier in its middle and is also sloped severely from left to right, making any miss left of the green a very difficult up and down proposition. Incline Village, Championship Course Hole 4: Ths medium length dogleg left par four has a generous fairway (just don't go left / OB). The approach, however, is difficult, especially to front pins as the surface is hard and runs away from the player, yet the big bunker to the front-right of the green must be avoided. Incline Village, Championship Course Hole 6 (right): This hole ranks as one of the most difficult par 3’s anywhere. At over 200 yards, the slightly downhill shot must be perfect. A deep creek cuts right in front of the green with no bailout short and the only respite hidden left behind trees (and leaving a nasty chip). Anything right or long will catch a bunker or deep rough. Otherwise, those shots may actually bounce down the hill to hidden OB. The green is severely sloped as well. 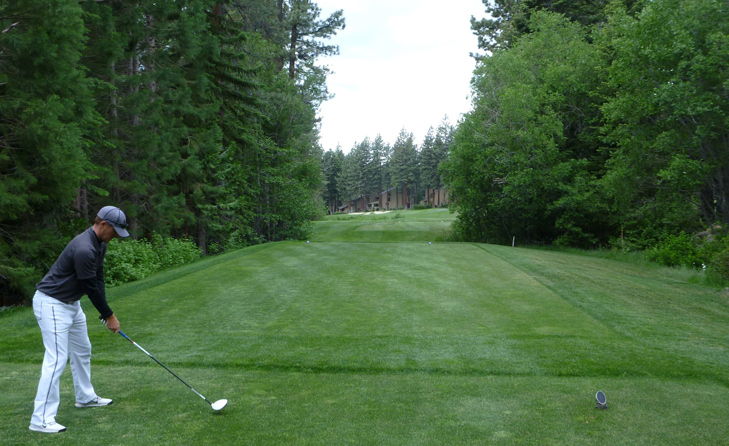 Incline Village, Championship Course Hole 7 (below): Mentioned mostly for its commanding view of Lake Tahoe from the tee-box, the 7th is a short, downhill par four that doglegs right over a creek. In addition to OB left and a hazard right, any shot right of center off the tee that does not travel far enough may be blocked out by trees and leave a forced slice or lay-up. The green is sloped heavily from right to left so the approach shot has to take that into account if the player is to make birdie. Incline Village, Championship Course Hole 9: The finishing hole to the front nine is the very definition of tight, especially from the back tees, where the drive must fly through the shoot of trees, and then avoid more trees left and OB to the right, all with the prevailing wind usually pushing shots to the right. Then, the hole turns down the hill to a green with bunkers left and right, with Lake Tahoe as the backdrop. Incline Village, Championship Course Hole 10: This mid length par four features a tee box right by the clubhouse and putting green, so the player must be ready to be watched. The drive must avoid the bunkers on both side and OB left, but the golfer can spray right. the green is over a creek (well short of the green) and is protected by bunkers on both sides. 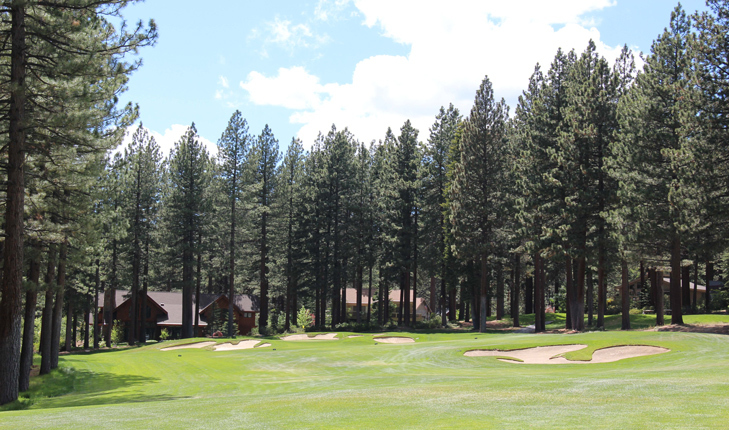 Incline Village, Championship Course Hole 11 (right): This great short par 5 is all about the approach to the green. The drive must simply avoid going left out of bounds and is no real problem. The decision is then on the 2nd shot: either try to clear the creek with a long iron or fairway wood, or lay-up. The green is very shallow and multi-tiered and there are bunkers behind to catch any shot going long, so any type of shot played into it must be precise. Incline Village, Championship Course Hole 12 (below): The twelfth is a severe dogleg right with large bunkers in the corner of the dogleg. Going over them is possible to leave a wedge, but if pushed, the ball is gone and if pulled it might be through the fairway. The approach is downhill, over a creek to a green that runs away from the player on the back half and has deep bunkers front left and right. Incline Village, Championship Course Hole 13: Even from the second set of tees, this dogleg right par five is over 600 yards long and features OB right and left for the entire hole. Thus, the golfer must hit three long shots that stay on target to avoid a big number. The green is also well protected by bunkers. Incline Village, Championship Course Hole 14: This slightly downhill long par 3 features trouble left. With a stream that turns into a lake, and back into a stream, anything going that way is dead. On the right side are several bunkers that are a much better option for a bailout shot. The green is fairly flat so the key is on the drive. Incline Village, Championship Course Hole 15 (right): This beautiful par four is well shaped and needs two well placed shots, avoiding the bunkers on both sides and the creek crossing the fairway to spell success. The green slopes sharply from right to left and makes putting quite difficult. Incline Village, Championship Course Hole 16 (below): Similar to the golf hole before, but more forgiving, the fairway is pretty wide but does have OB right and trees left. The approach is over yet another creek to a well-bunkered and angled green, and is slightly uphill to as well. Incline Village, Championship Course Hole 17 (left): This short par 3 features a shot between an incredibly tight shoot of trees. Any slight push or pull will spell disaster and a 2nd try at the green. The large bunker short-right of the green gobbles up a lot of shots, but the real mistake is to go too long which might bound a shot into the hidden hazard. Incline Village, Championship Course Hole 18 (below): The most difficult golf hole on the course to play a fade, this uphill, dogleg left par four is a beast. The best drive is to take the shortcut over the bunker on the left side of the fairway, which also leaves a better angle to the green. However, anything too far left will be on a hillside with 1,000 range balls. The right side is not much better as the approach will be over a small series of ponds to the right of the green and a large green-side bunker short-right.